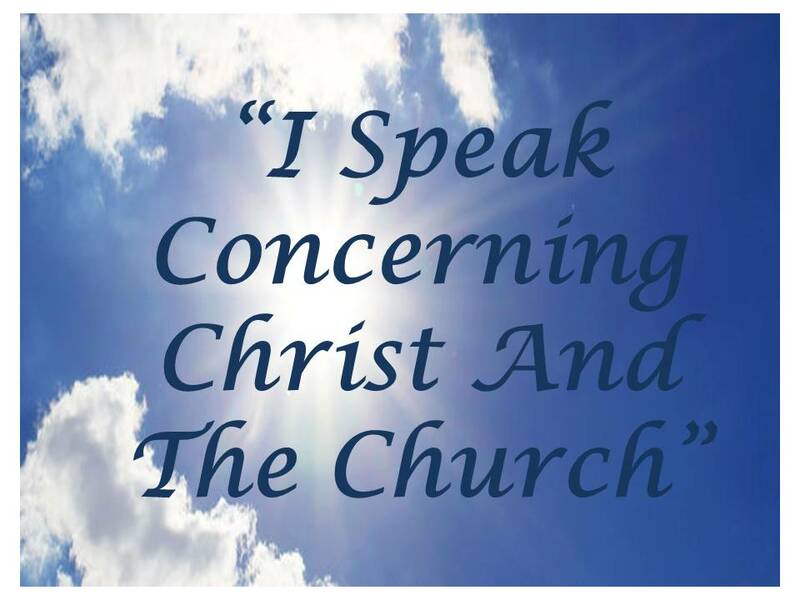 What did Paul mean when he said, “I speak concerning Christ and the church”? 1. Paul spoke concerning Christ as the head of the church. Christ is the head of the church just as the husband is the head of the wife. “Wives submit yourselves unto your own husbands as in the Lord. For the husband is the head of the wife, even as Christ is the head of the church” (Ephesians 5:23). The seat of power and authority resides in the head of any organization or institution. Christ, who is the head of the church, has all power and authority in heaven and on earth (Matthew 28:18). It is the Father’s will “that in the dispensation of the fullness of times he might gather in one all things in Christ, both of which are in the heaven, and which are on earth; even in him” (Ephesians 1:10). God has raised up Christ “from the dead, and set him at his own right hand in the heavenly places… And has put all things under his feet, and gave him to be the head over all things to the church” (Ephesians 1:20, 22; 4: 15, 16). The headship of Christ over the church is also emphasized in the Colossian letter in several places (Colossians 1:18, 19; 2:19). 2. Paul spoke concerning the submission of the church to Christ. “Therefore as the church is subject unto Christ, so let the wives be to their own husbands in everything” (Ephesians 5:22, 24). Christ is the author of eternal salvation only to those who obey him (Hebrews 5:8, 9). The church is subject to Christ who is said to be “the Shepherd and Bishop” of our souls (1 Peter 2:25) and “the chief Shepherd” (1 Peter 5:4). To be in subjection to the chief Shepherd we must also submit to the under shepherds known as elders, bishops, presbyters, and overseers (Hebrews 13:7, 17; 1 Timothy 3:1-7; 1 Peter 5:1-5). 3. Paul spoke concerning the love of Christ for the church. “Husbands love your wives, even as Christ also loved the church, and gave himself for it” (Ephesians 5:25). Christ loved his wife (church) more than his physical body. “So ought men to love their wives as their own bodies… For no man ever yet hated his own flesh; but nourisheth and cherisheth it, even as the Lord the church” (Ephesians 5:28, 29). Christ loved the church so much that he shed his blood in order to purchase it (Acts 20:28). The church is composed of those persons whose sins have been remitted by the precious blood of Christ (Matthew 26:28; Ephesians 1:7; Revelation 1:5). 4. 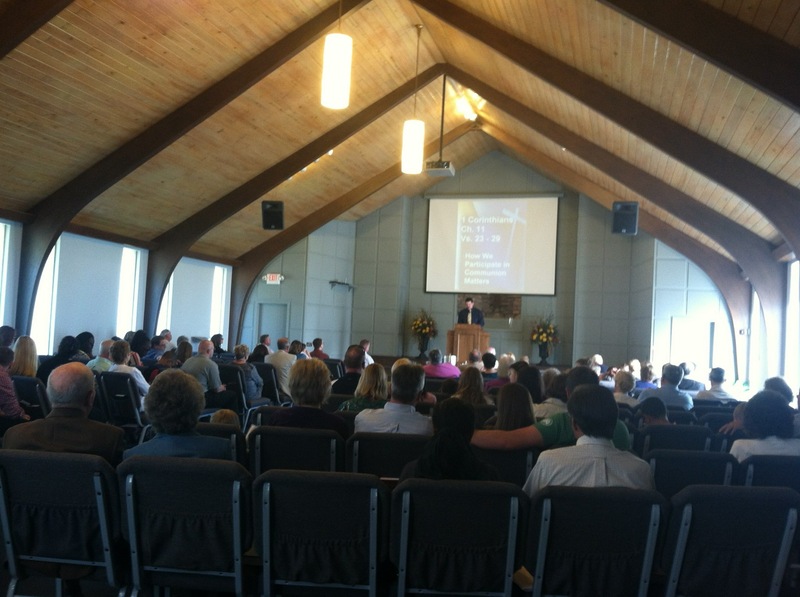 Paul spoke concerning Christ sanctifying and cleansing the church. Christ loved the church “that he might sanctify and cleanse it with the washing of water by the word” (Ephesians 5:26). “The washing of water” is said to refer to baptism by most all Bible students. This is what Ananias had reference to when he told Saul of Tarsus to “arise, and be baptized, and wash away thy sins, calling on the name of the Lord” (Acts 22:16). This is the same thing that Jesus meant when he said that one must be born of water and of the Spirit or he cannot enter into the kingdom of God (John 3:3, 5). The Hebrew writer had reference to “the washing of water” when he spoke “having… our bodies washed with pure water” (Hebrews 10:22). The Ephesians were sanctified, cleansed, and washed exactly like the Corinthians who, hearing, believed, and were baptized (Acts 18:8). Several years later when Paul wrote a letter unto them he said, “… But ye are washed, but ye are sanctified, but ye are justified in the name of the Lord Jesus, and by the Spirit of our God” (1 Corinthians 6:11). This is all done by means of the word of God (John 15:3; 17:17; 1 Peter 1:2; 1:22, 23). The only way into the church or body of Christ is by baptism (1 Corinthians 12:13). 5. Paul spoke concerning the church as the spiritual body of Christ. “Christ is the head of the church; and he is the Savior of the body” (Ephesians 5:23). God gave Christ “to be the head over all things to the church, which is his body” (Ephesians 1:22, 23). Both the Jews and the Gentiles are said to be reconciled into the one body (Ephesians 2:16) and made fellow heirs of the same body (Ephesians 3:6). There are many members, but there is just one body (Romans 12:4, 5; 1 Corinthians 12:20). Shelby G. Floyd wrote this article and it was printed in The Informer, the bulletin of the Garfield Heights Church of Christ, July 20, 1969. At that time I was 32 years old. I still believe and proclaim the same message today at 79 years old!